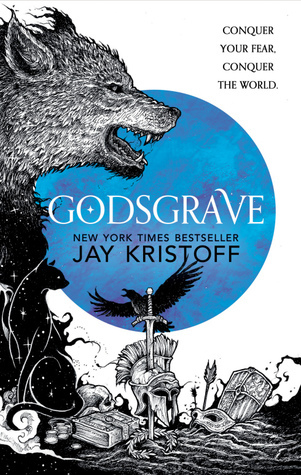 Godsgrave is the second in Jay Kristoff’s “Nevernight Chronicle” fantasy series. The series looks at the actions of Mia Corvere, a young woman with a thirst for revenge, a talent for assassination, and a companion who lives within her shadow. 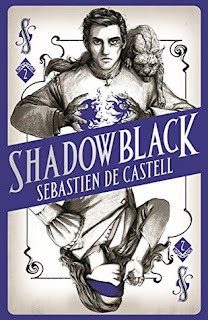 I really enjoyed the first outing in the series, which blended some sharp dialogue with a strong core narrative and solid characterisation, so this new entry was hotly anticipated. To get it out of the way: I enjoyed it. A lot of the same things that made the first book work are resent here, and there was enough new material that I kept on turning pages. Kristoff has created a detailed and thoroughly convincing world, with flashes of renaissance Italy and strains of late Republican Rome. Those influences seep through in the text, which is largely centred around a series of gladiatorial games. There, slaves compete for the honour (and profit) of their masters, and one of the lucky competitors gets their freedom, and the chance to hobnob with some of the highest born and most well-protected members of the aristocracy. Which is handy if your revenge requires you to assassinate them. Thus does Mia Corvere end up infiltrating one of the gladiatorial houses, with nothing much between here and her vengeance except a small pile of other people’s bodies. Mia is always a pleasure to read. At heart she’s a young woman who has been through severe trauma. But she’s not just that, being something of a multifaceted dark jewel. There’s a brutal pragmatism, with a charming indifference to body count. But that exists alongside a personality which longs for and fears connection and emotional intimacy. As those around her become friends and colleagues, and not just obstacles in the way of her goal, she struggles with the ruthlessness required to follow through on her goals. This is further emphasised in her travails in forming romantic attachments; watching the often surefooted Mia stumble through serious emotional entanglement is a terrifying delight. She is, as the saying goes, so sharp that she might just cut herself, and we’re left waiting to see what she does. The hard-skinned assassin is here, the ruthless killer – but also a lonely woman and the armour she’s placed over a traumatised young girl. At the end, Mia is a complex, troubled, troubling character – and the intricacies of her personality, and her own internal conflicts, make for a compelling protagonist. In this she’s ably assisted by a strong supporting cast; if we see them through Mia’s eyes, they’re no less believable for all that. Really my only complaint is that we don’t see enough of them. That said, if Mia is possessed of conflicts, the same isn’t to be said of her closest compatriot – the mysterious creature that lives within and shapes itself around her shadow. The eponymous Mr. Kindly is sharp-witted, and has a dry, wry tongue like a razor, which is rather fitting really. There’s an acerbic, venomous humour to his chats with Mia which had me chuckling in appreciation every time he popped up. I’m still not sure what he gets out of his relationship with Mia, and am interested to find out as the series proceeds, but for now he’s just a lot of fun to read. The footnotes laced through the text, placed there by our narrator, have a similarly waspish and cynically observant style; some may find them too much detail, or dislike the style, but I think they fit for the way the text is constructed. That they’re informative as well as often blackly humorous is a plus. The world is as vivid as ever. There are moments when you can feel the crunch of sand beneath gladiatorial sandals, or see the tinge of blood on a knife. The pace is quick, and tends to end in blood, or violence of one sort or another. But if there’s more than enough action set-pieces to satiate the most blood-thirsty, there’s also heart-rending and surprisingly uplifting emotional beats. The world Mia inhabits is one filled with living, breathing humans – and the systems which they’ve created. The politics of the world are happening out of frame of the novel, but they’re still impacting it; as we become more aware of the intricacies of the social systems of the space, and the inequalities that exist within it, so does Mia, and that’s one of the more emotionally evocative arcs of her character. I haven’t touched on everything here, but to sum up: the world continues to be a multi-layered gem, filled with both small, convincing details, and strangely familiar institutions. Mia is a sharply observed and complicated woman, and her vengeance is fast-paced, bloody, and a bloody good read. If you’re already a fan of the series, Godsgrave is a fantastic entry. If you’ve not started the series yet, I strongly advise you to start immediately. This is top stuff. 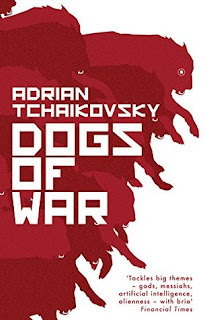 Dogs of War is a standalone sci-fi novel from Adrian Tchaikovsky (whose science-fiction credentials include the superlative Children of Time, which we looked at very favourably last year). It’s a book which explores a lot of interesting ideas, including the role of artificial intelligence in society, exactly what we define as humanity, the ethics of conflict resolution and the manufacturing of sentient biological life. But it does all of this through a variety of different perspectives, from civilian medical personnel to military bioforms, offering a personal view as an immediate and emotional underpinning to its exploration of these big ideas. It is one of the finest sci-fi novels I’ve read this year, and if you’re looking for a new book to read in the genre, it should probably be this one. So, looking at it in detail, what’s it about? Well, the central character is Rex. Rex is a bioform, an artificially created life. We’re along for the ride in Rex’s head, and that head is one which marries sentience with different instincts to our own. Derived from canine stock, then bred for war and cybernetically integrated with weapon systems, Rex is extremely loyal to his Master, and extremely dangerous to those he’s told are the enemy. He works in a unit with other bioforms, each as weird, wonderful, and thoroughly deadly as the last. Perhaps the greatest triumph of the text is in giving the reader a great many non-human viewpoints to consider – from Rex’s canine loyalties and desire to help, to the combined consciousness of a cloud of weaponised bees, and the quietly murderous thoughts of a giant reptile. They’ve been given the ability to think, and to communicate with each other, within the bounds of their cybernetics, and each of them thinks differently, speaks differently, and reads differently on the page. Unfortunately for Rex, his desire to do what his Master wants, indeed his almost inability to refuse, means that he may do some rather bad things. This throws up some exciting questions, first about the role that diminished actors could take in the commission of what might otherwise be war crimes, and about the responsibility and ethics that would come with the creation of new sentience. Actually, the lack of ethics is something more on the table here. At the same time, there’s an ongoing conversation about whether these bioforms, created in laboratories to fight others wars, are themselves actually people. That particular thread rumbles in the background of the narrative; as a reader, it’s possible to walk alongside Rex as he begins to feel, if not more human, perhaps more independent – and as we begin to see him as something other than a weapon, as he is portrayed that way, so too does the wider context round bioform rights open up. There’s a fair bit of action here, laced bloodily throughout the text. It’s never glorified, and the consequences are shown, with a stark light that lets the reader form their own opions on the conflict. At the same time, the combat periods are kinetic, fast paced scenes with real impact – and the moments which explore what’s left behind are thoughtful and affecting without being mawkish. I have to admit, Rex’s unit working together is an awesome sight – and also one which is terrible. Kudos to the story for giving glimpses of both. There’s other stuff in here too; the narrative is layered through with complex questions. If Rex and his bioform colleagues are alive, what does that say about artificial intelligences, also in their infancy in this near-future world? If bioforms are awarded personhood, how does society deal with people who are always heavily armed or actively designed to kill? Seeing that the conflicts Rex has, to be someone, to decide whether he actually wants to be anything other than a follower of his Master’s voice – well, they’re beautifully, honestly portrayed, and a very difficult read. At the same time, they ring true, evoking the US civil rights movement, or the institutional struggles of South Africa. This is a book which is trying to look at big issues in a future context, and also tell us something about humanity, and I think it succeeds. Rex’s personal story – well, by the end of the book, listening to his voice, his thoughts, his feelings, and knowing has sacrifices, I’d been moved to tears several times. Though the story approaches and explores these grand ideas, and does so with complexity and nuance, it’s not afraid to give us stakes in the game. This isn’t a dry, academic exploration of social changes. It’s raw and bloody and personal – and fantastic. Once again: this is one of the best science fiction books I’ve read this year, perfectly blending larger themes and big ideas together with a personal, emotional story; it’s a feast for the mind at the same time that it wrings out the heart, and I can’t recommend it enough – go buy it. 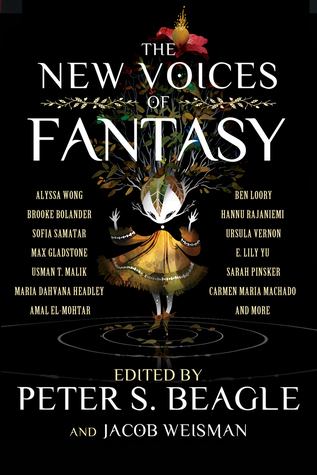 The New Voices of Fantasy is a collection (edited by Peter S. Beagle) of some of the best short fiction from ‘up and coming’ fantasy authors. 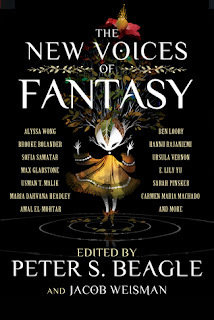 There’s some Nebula and Hugo award nominees and winners amongst these stories – and if awards aren’t the only indicator of quality, still they’re suggestive. The work as a whole is of a very good standard, and there’s some interesting themes explored, and questions asked – and, occasionally, answered. There’s a range of stories here, from the hard-edged sentiment of Max Gladstone’s “A Kiss with Teeth”, where Vlad the Impaler struggles to relate both to the modern world, and to his family, to the lyrical modern mythology of Usman T. Malik’s “The Pauper Prince and the Eucalyptus Jinn”, or the quiet secrets and gentle romance of Amal El-Mohtar’s “Wing”. Given there are nineteen stories in the collection, there’s always going to be some that fit a particular reader more than others, but the overall quality is very high. I won’t go through them all, but there are definite highlights. I have a lot of affection for Alyssa Wong’s “Hungry Daughters of Starving Mothers” – a young woman who feeds off negative emotions is slowly drawn towards monstrous acts. Wong portrays a fragile, confused, powerful woman, unsure of who she is and wants to be – and the sacrifices she’s willing to make whilst working that out. “Left the Century to Sit Unmoved” from Sarah Pinsker is a piece of fantasy in the modern day, exploring why people are prepared to take risks, to fall with and for each other. In this case, the fall is literal, as inhabitants of a town leap into a possibly bottomless pool. Not all of them return, but the exploration of why people would jump in the first place is compelling and emotionally evocative. Ben Loory’s “The Duck” is a heartwarming piece, ostensibly about a duck who falls in love with a rock. The other ducks are perhaps less than supportive of this decision. The piece is a pleasant allegory, exploring what it means to fit in, or to deliberately not do so. It wants to examine what people are willing to do for each other, and for love, romantic and otherwise. It’s likely to raise both a chuckle and a smile or two. Maria Dahvana Headley’s “The Tallest Doll in New York City” is an enjoyablu whimsical piece where the buildings of New York are both sentient and mobile. It’s a love story of architecture, with a thirties thread running through it. The protagonist, at least nominally, is a waiter in one of the buildings, who is also on the lookout for romance in this Valentines Day modern fable. Those are, of course, just a sample. There’s more here, from the wry, ironic and often darkly appalling “Here Be Dragons”, tracking a pair of con-men in a sword-and-sorcery world, now trying to fit back in to village life with their wives and children, to the travelogue-esque “My Time Among the Bridge Blowers”, a story which is putatively a description of a small mountain society, but which also explores the ideas around power, formation of narrative and colonialism. As I say, there’s probably going to be some stories here which you find better than others, but the sheer diversity of work on display here, and the excellent overall quality, make this a collection that’s certainly worth exploring.